"It was so fast and easy to find insurers with such good prices, in addition to cooperative customers - THANK YOU!!!" "Thank you very much for this impeccable service, I will pass on the information to my staff." "What great services at our disposal. Customers, rates and assistance - well done." "I chose DevisProx because the entire company respects its customers - even the "small " ones, like me. The conversion rate is impressive, with an elaborate method." "I just took over my father's estate. In three months, I found more new customers than him in three years - and all that without moving. Great new technology, thank you DevisProx." "We chose DevisProx because it is absolutely the most serious and flexible lead supplier"
"Information, advice and perfect interactivity - all the ingredients to make my practice a successful and profitable company." 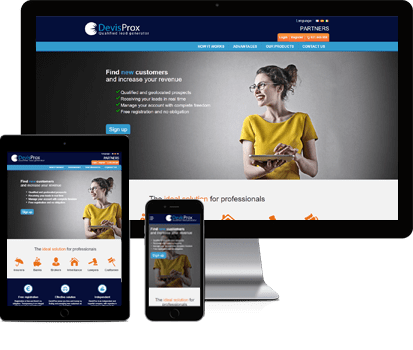 "Compared with the competition, DevisProx is the most flexible and professional." For 9 years, DevisProx has put select experts in touch with individuals for very specific research. Thanks to our comprehensive forms, you receive quality leads for the geographical area of your choice. A tracking tool is at your disposal, along with an email alert sent upon receiving a new prospect. Change your settings online, and activate or deactivate your account according your needs. Do you want to develop a new product or expand your geographical reach? You're a click away! Locate your prospect's address on a map with just one click. No need to stay at your desk - even on the move, you can quickly respond to new prospects and increase your conversion rate thanks to strong responsiveness.